Rock and Pebble‘s H blocks are a bit of a surprise. 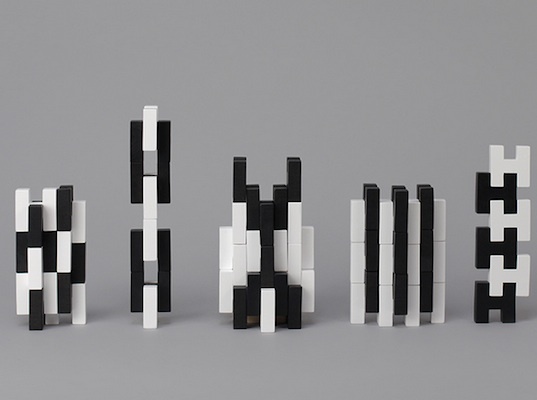 At first glance they seem like simple and striking stacking toys, but upon toying with them (and everyone in your family will find themselves picking up these blocks), H blocks become the perfect blocks for constructing and playing with architectural designs. These solid beech blocks don’t just stack — they fit together in a variety of different configurations almost like a puzzle, so kids within multiple age groups will continue to be interested in rearranging them. Each 18-piece set is available in white, black, or neutral, and you can combine the colors for dramatic and striking sculpture-like creations. We love how these blocks work little minds and hands and encourage kids to think beyond the typical cube-shaped blocks for building. And if your child’s name begins with an “H?” Forget about it… there won’t be a cooler, more hands-on personalized toy around. Available for pre-order for an expected late September delivery. Rock and Pebble's H blocks are a bit of a surprise. At first glance they seem like simple and striking stacking toys, but upon toying with them (and everyone in your family will find themselves picking up these blocks), H blocks become the perfect blocks for constructing and playing with architectural designs. These solid beech blocks don't just stack -- they fit together in a variety of different configurations almost like a puzzle, so kids within multiple age groups will continue to be interested in rearranging them. Each 18-piece set is available in white, black, or neutral, and you can combine the colors for dramatic and striking sculpture-like creations. We love how these blocks work little minds and hands and encourage kids to think beyond the typical cube-shaped blocks for building. And if your child's name begins with an "H?" Forget about it... there won't be a cooler, more hands-on personalized toy around. Available for pre-order for an expected late September delivery.